and makes the gun ready to fire. 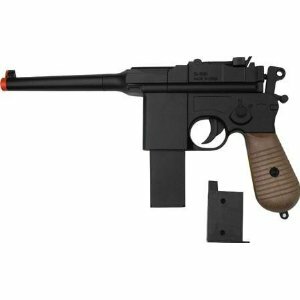 Spring Airsoft Guns are the toughest, most durable of all Airsoft Guns, because they're made with few breakable pieces. If you are looking for something fun, and reliable you have come to the right online retailer to buy it from, not to mention we are the CHEAPEST on the Net! A World War II collectible design was used for production of this airsoft gun. Not only WWII guys flock to this gun but Star Wars Fans as well. It looks like the gun Hans Solo Used in the movie. This is the plastic version; we also have a metal version for sale as well.